With this council vote the development of land into a sweatshop will be allowed without the provision that the developer set aside 2.5 acres for open space. This vote is a setback for the farmers but it does not mean an end to the fight over the development of the site. What ever is proposed still needs the approval of the planning commission and the option of legal action over the legality on the original land sale is still open. Tezo stated that challenging the project at the planning commission is the next move. 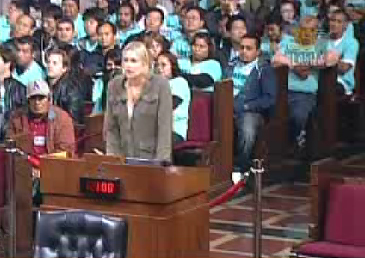 Councilperson Jay Perry packed the council chambers with employees of the consortium that plans to develop the land. It is believed that many of those there in support of the development were paid or pressured by their employer to attend the council session today. Despite Perry’s attempt to stack the deck some of the farmers and their supporters did get a chance to speak. Supporters included: Film actress, Daryl Hanna, Green party activists, Mike Feinstein and Linda Piera Avila, and the famous tree sitter John Quigley.